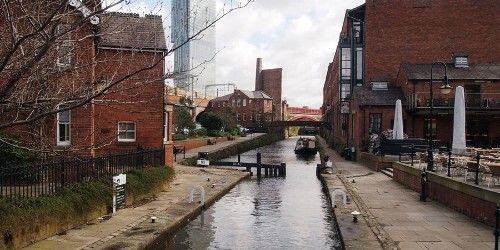 Take a detour from Manchester city centre and step down into the drained Lock 92 for a unique look inside the 200-year-old canal. This weekend visitors will be able to walk on the bottom of the drained lock chamber to see the unusual flooring which was carved out of the bedrock. They’ll also be able to inspect the lock gates while learning about looking after this busy section of canal. The works to the Rochdale Canal are costing £250,000 and are being carried out as part of the Canal & River Trust’s £38 million, five-month programme of repairs to England and Wales’ waterways over the winter. Two lock gates are being repaired at Lock 88 and Lock 92 as well as essential works to several other locks along the 200-year old Rochdale Canal. Before work started, the our maintenance team installed dams to stop the flow of water to enable them to carry out the work. Over 60 tonnes of litter and debris has been removed by a digger to clear the locks. The lock gates will then be relined using a specialist spider crane. Mark Wigley, from the Canal & River Trust, said: “We’re delighted that we’re able to hold an open day at the iconic Dukes Lock in Manchester. It’s really exciting to show everyone all the hard work that’s gone into its restoration. It’s important the Trust carries out these vital repairs to ensure the canal in our wonderful city of Manchester is kept in great working order for everyone who loves and uses it. Next articleCity Vs United: Which one has the best match day experiences?